The Western Conference saw plenty of action this past weekend with surprise scorelines and international players departing for World Cup Qualifying. Despite that, plenty of talent was on display. Juan Agudelo and Darren Mattocks turned in their best performances of the young season while Chris Wondolowski found the back of the net. Real Salt Lake suffered from shoddy defending and Josh Saunders will want a play or two erased from his memory. Check out the latest Western Conference news. Despite scoring the first goal in this one, the Vancouver Whitecaps ended up falling 2-1 on the Houston Dynamo’s turf (er, grass). In the 36th minute, Darren Mattocks received a pass from Erik Hurtado and turned Dynamo defender Eric Brunner, freeing himself up to then blast a shot past goalkeeper Tally Hall. Mattocks’ goal put Houston in danger of losing their first game at BBVA Compass Stadium, but second half goals from the Dynamo’s Giles Barnes and Warren Creavalle ensured that the Caps did not walk away with a win after all. Vancouver had chances to equalize towards the end of the match, most notably through a Camilo free kick that struck the crossbar, but in the end it was not meant to be. Still, the Caps showed well in one of the toughest road environments in MLS. 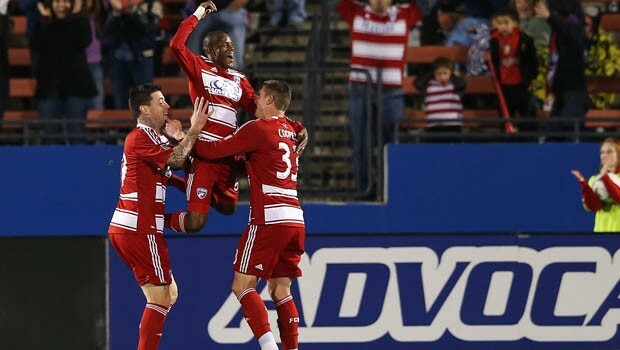 Dallas put in an excellent home performance to beat RSL 2-0 courtesy of goals from Fabian Castillo and Jackson. The home side came out attacking from the start and caused plenty of problems for their visitors, but the score remained locked at 0-0 until the 70th minute. That was when Castillo ripped a shot into the upper corner from the left. Dallas’ second goal came in the 81st minute when Jackson punished RSL backup keeper Josh Saunders for taking a bad touch on a back pass. Earlier, RSL had almost gone down after 22 minutes, but luckily Nat Borchers cleared a sure Kenny Cooper goal off the line. With less than 10 minutes to go, though, RSL midfielder Yordany Alvarez earned himself a second yellow card, for diving, and the road team was left to finish their night with ten men. An encouraging win for Dallas, but a poor loss for RSL, whose start to the season hasn’t been stellar. A Mike Magee penalty was the difference in this 1-0 win for LA over the Colorado Rapids, but the Galaxy looked dominant throughout the match. Clint Irwin, in goal for the injured Matt Pickens, managed serious damage control for the Rapids; his saves helped keep LA from achieving a more flattering, and perhaps more accurate, scoreline. But the Galaxy got their opportunity to pull ahead early in the second half when Rapids defender Drew Moor struck Marcelo Sarvas in the face inside the area; he was walking off the pitch before the referee had even pulled out the red card, and Magee converted the resulting penalty. For Colorado, a new injury to Pablo Mastroeni compounds an overall lacking performance. LA, meanwhile, continue to impress in the early going of this season. A rare outside-the-box strike from Chris Wondolowski gave the Quakes this win and left the Sounders winless in their first three matches. Both teams were missing key players due to international call-ups, and although Seattle held much of the possession throughout the match, they couldn’t put any of their chances away. San Jose, meanwhile, also had their share of opportunities, and Wondo’s goal just before halftime was one of several chances he had in the first half. Last season’s leading goalscorer, who had yet to score this season, brought the ball down with the outside of his foot and struck his shot from 22 yards. For the rest of the match, Sounders keeper Michael Gspurning made some big saves to keep the Quakes from scoring again, but ultimately Wondo’s goal was enough. On their first road trip of the season, Chivas USA bounded to a 4-1 victory over the Chicago Fire and settled themselves in second place in the Western Conference. After a scoreless first half, Chivas enjoyed most of the chances in the second. It was a goal from Edgar Mejia, ripped from outside the box in the 57th minute, that started the scoring. Patrick Nyarko evened the score not long after, but in the 73rd minute Joaquin Velazquez connected on a Mejia free kick and Chicago’s evening was effectively over. Juan Agudelo, who also assisted Mejia’s goal, made it 3-1 to the Goats with a curler in the 75th minute, and an own goal from Jalil Anibaba capped things off in the 89th. Right now Chivas are looking like a playoff team and proving a lot of people wrong in the process. This Chelís guy, he might know what he’s doing. Two of last year’s best Western Conference teams are struggling a little to begin their seasons. 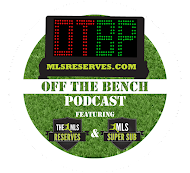 The Seattle Sounders currently sit last in the table and are winless so far; this week they were missing Eddie Johnson, Mario Martinez, and Obafemi Martins, but still, they’ll feel due for a win. Meanwhile, Real Salt Lake looked poor against Dallas and not like the team that started things off with an away win against San Jose. Interestingly, RSL host Seattle next weekend; it’s sure to be a great match. While Seattle and RSL are having trouble, though, two of last year’s worst Western Conference teams seem to have turned things around. Dallas were dangerous against RSL and earned their three points, and Chivas punished a poor Chicago side with style. Who expected to see these teams sitting one and two in the conference? Next week, LA and Dallas travel to Toronto and New England respectively. The Colorado Rapids host the Portland Timbers, while San Jose visit Houston to see if they can finally break the Dynamo’s unbeaten streak. Then, we have two all-west match ups with RSL hosting Seattle and Chivas hosting Vancouver. Juan Agudelo. The young American striker is producing for Chivas and showing the kind of talent US (and of course Goats) fans want to see. Against Chicago he had an assist and a goal, and both were great.